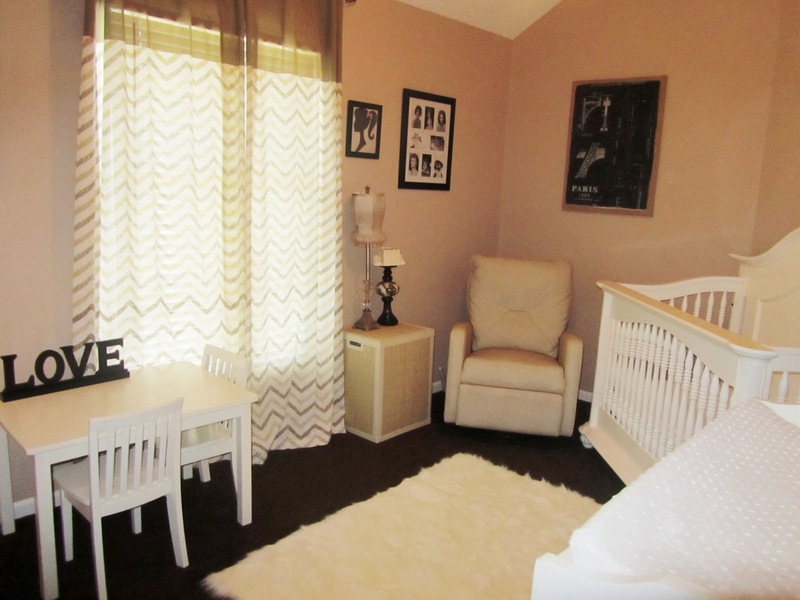 When I found out Avery was going to be a girl, I launched into pink overdrive when it came to decorating her nursery. The walls are pink. There are birds, butterflies, polkadots and princess crowns a-plenty. I absolutely love her room and plan to do a blog post about it soon now that she has her big girl bed, but I sort of got the pink-and-green-shabby-chic thing out of my system the first time around. 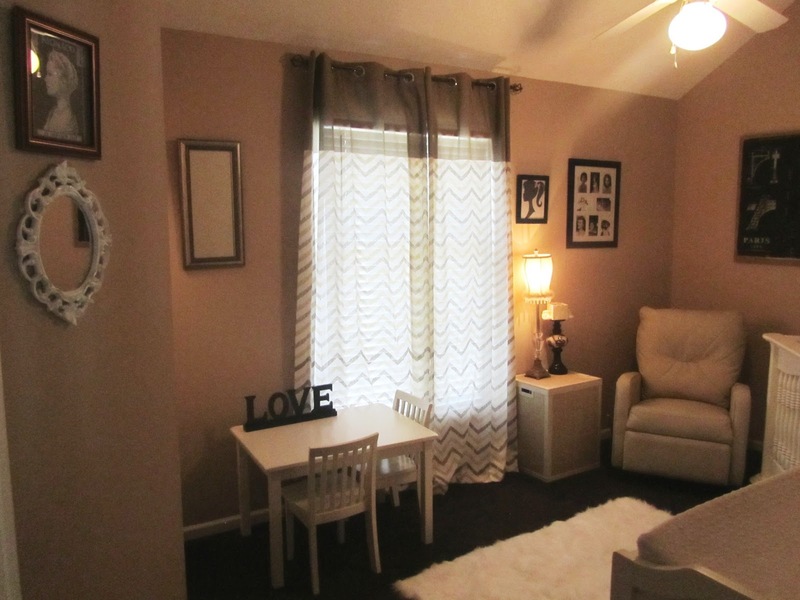 This time I wanted something calming, neutral and sophisticated. A room where I can just escape from the noise of the house and relax with my new baby. 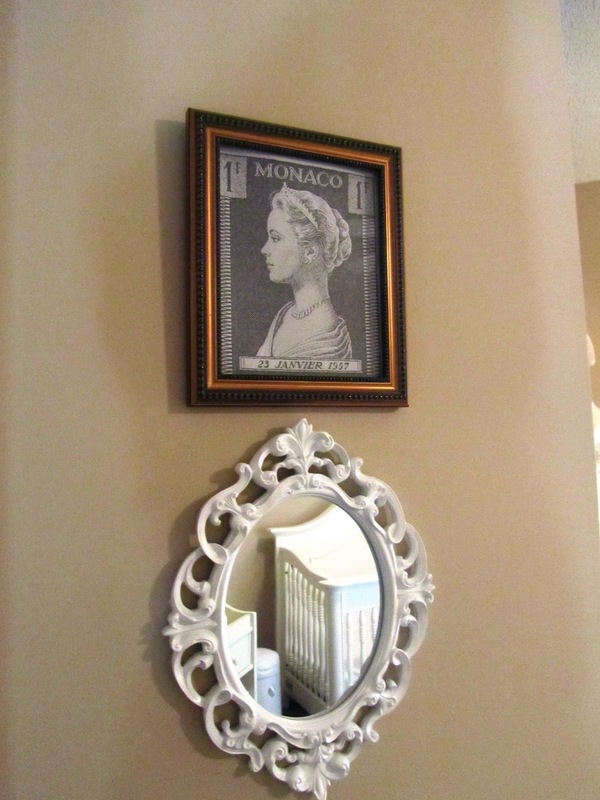 As I often do when decorating a room, I started with the artwork. 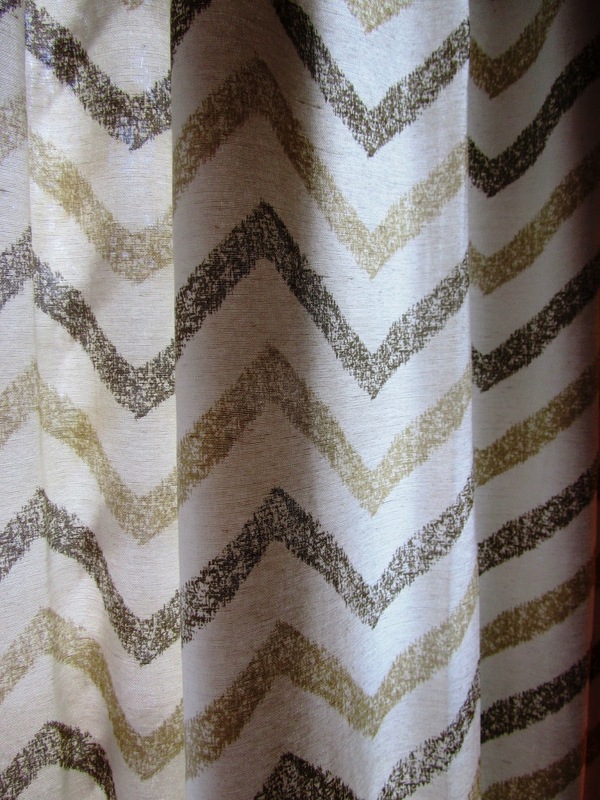 I like the raw texture of the wire and burlap on this picture from Home Goods. I also like that it’s not traditional nursery artwork but it’s still interesting to look at. I have always loved the quote, “A girl should be two things: Classy and Fabulous” (attributed to Coco Chanel) but I’m personally not a big fan of the wall quotes trend. 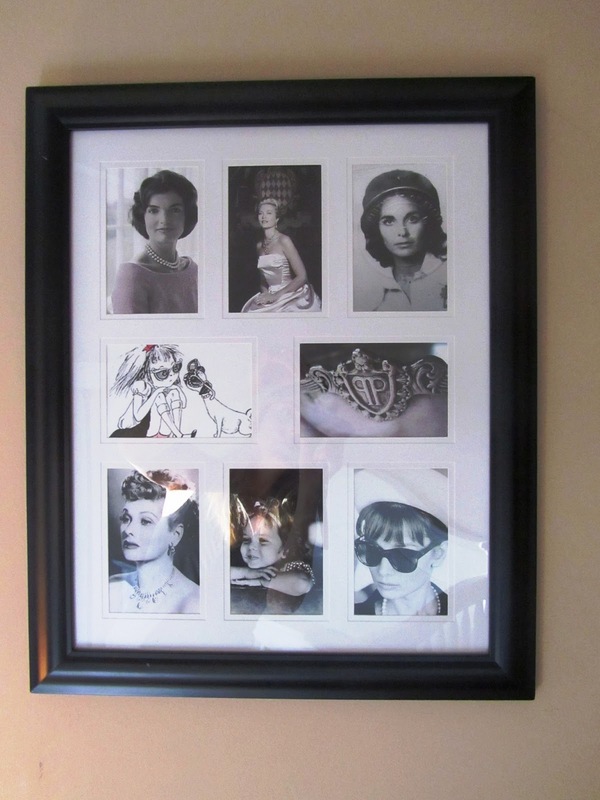 I drew from the spirit of the quote and made a collage of some seriously classy and fabulous females: Jackie Kennedy, Princess Grace of Monaco, my beautiful mom (that is her passport photo from the 60’s on the top right! ), Eloise and the logo of her beloved Plaza hotel, Lucille Ball, Shirley Temple, and Audrey Hepburn. 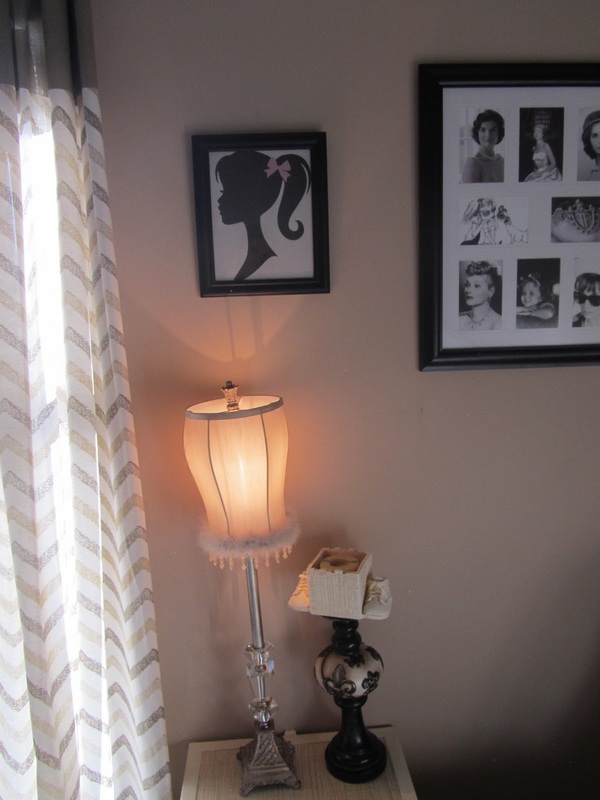 I also found this super glam lamp at Home Goods and accented it with a vintage Barbie silhouette. The adorable candle holder with the baby shoes is mine from when I was little. 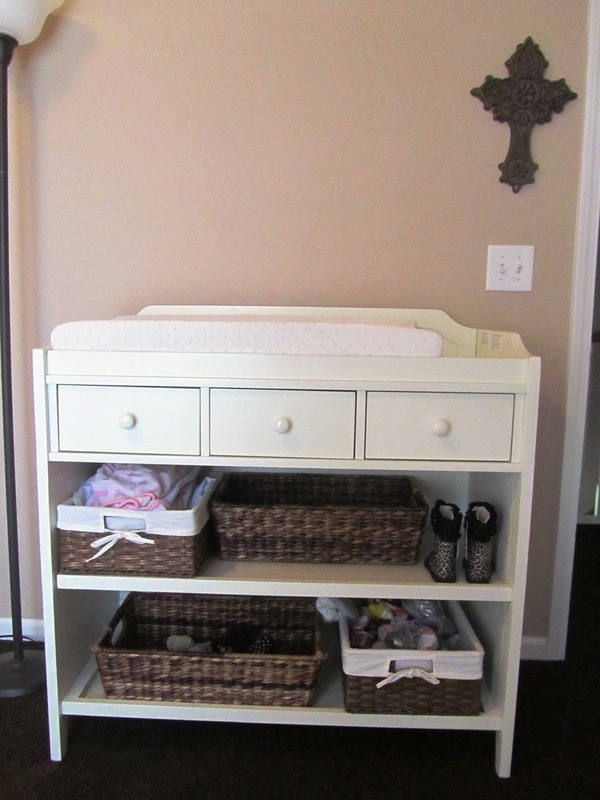 The new baby is inheriting Avery’s antique white changing table from Pottery Barn Kids. The baskets are from Target and are filled with things that need to be grabbed quickly like towels, diapers and wipes on the top shelf. The bottom shelf is where I put all of Avery’s old socks and shoes for the new baby. The rug is probably my favorite thing in the whole room. It’s faux sheepskin which means it feels super soft and cozy AND it’s washable. Audrey feels right at home on it, as you can see! 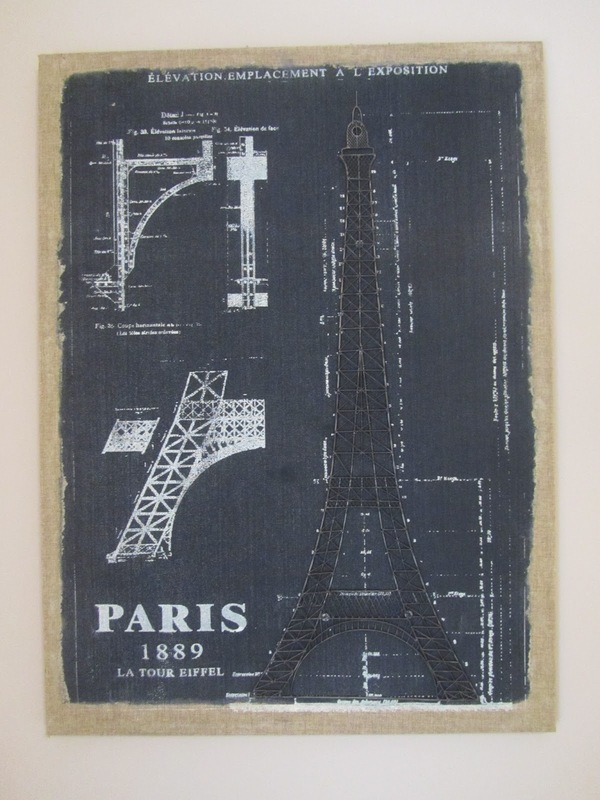 I found it at Home Decorators Collection and it comes in multiple sizes and colors. Rather than using a traditional end table for the lamp, I purchased a hamper from Home Goods. Not only was it less expensive than a fancy table, it’s very sturdy and doubles as extra storage for stuff like blankets, diapers or toys. I actually did the same thing in Avery’s room and it worked out really well. Look in the bathroom section first before you try finding end tables. 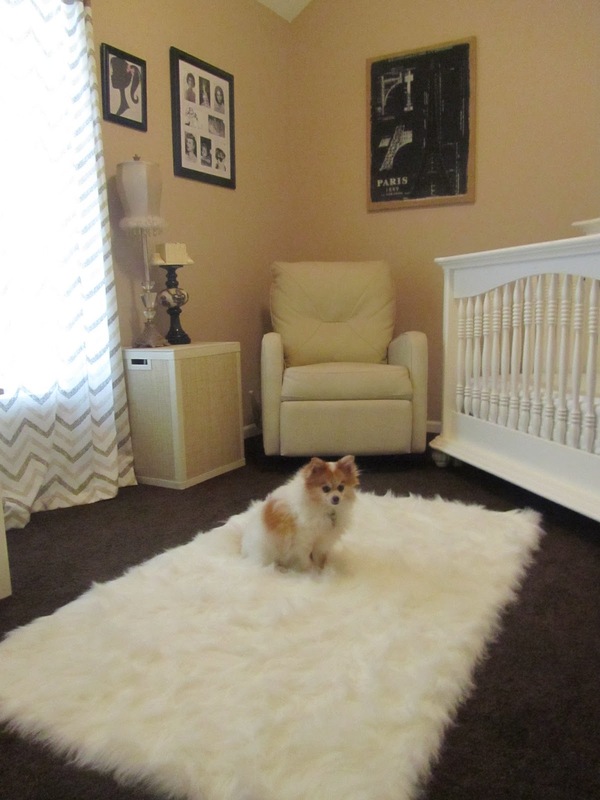 They are inexpensive and more practical for a nursery! The table is from Pottery Barn Kids. We used to keep it in our kitchen for snack time, but now I am going to use it as a puzzle/coloring book table for Avery when she is in there with me and the baby. Currently the nursery being used to keep Marisa’s wedding dress out of harm’s way until Saturday, but in 5 short weeks it will be home to our precious new baby!